I hope that you had a great Thanksgiving. 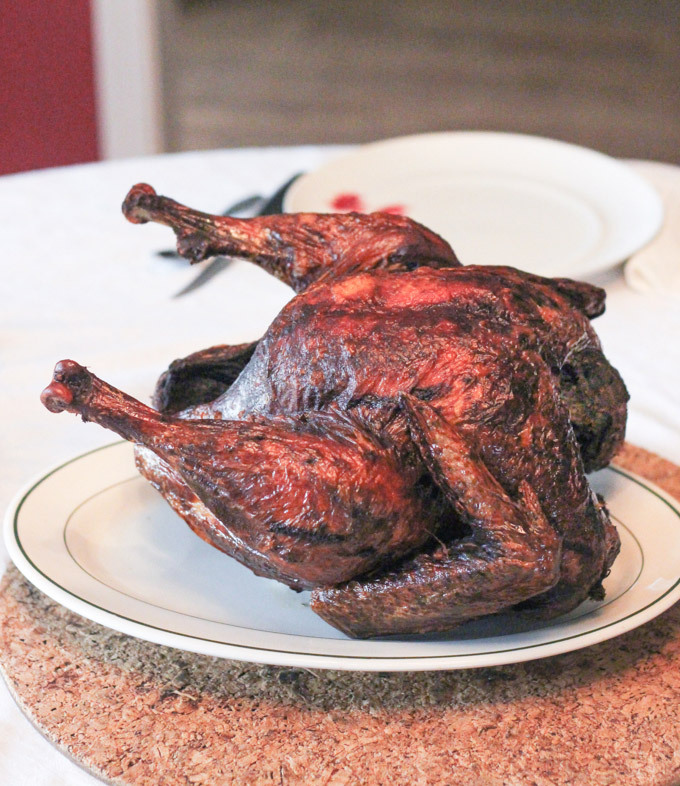 Up here in the Hinterlands, I decided to prepare a Deep Fried Thanksgiving Turkey for the family and boy oh boy was it good! 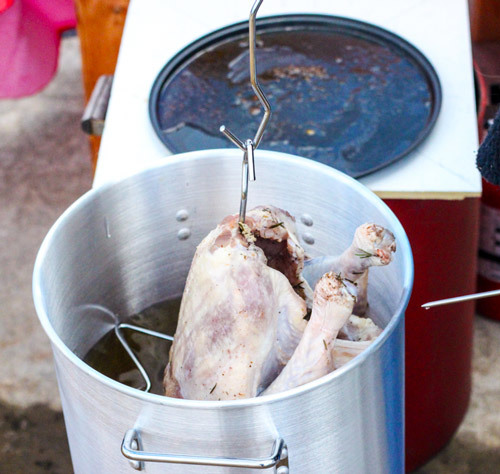 This was the first time I have done a deep fried turkey, so I did quite a lot of research on the subject as well as doing a couple of trial cooks on smaller things to make sure I knew what to expect. 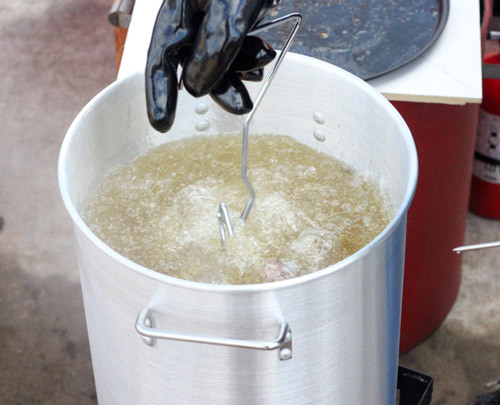 One of the leading causes of house fires over the Thanksgiving season is grease/oil fires. I would think that this is due to most folks that try this are frying a turkey for the first time. 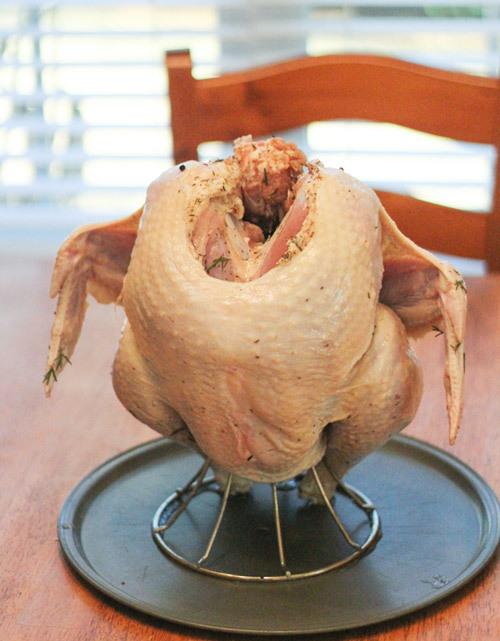 I wrote a brief post late last week called so you decided to fry a turkey, now what. This was an attempt at conveying the hazards of the undertaking and that they are not to be taking lightly. I bought our bird about 3 weeks before Thanksgiving and started to process to get it ready on the Saturday evening before. I started by defrosting it in the refrigerator for 3 days. On Monday, I took it out and used it to check the level of oil necessary to cover it in the cook pot. I did this by placing the turkey in the cook pot and used a 1 gallon pitcher to fill the pot with water till it was about 2 inches over the turkey. It took a little over 3.5 gallons so I bought 4 gallons of Peanut oil to be sure I had enough. It is recommended to use a high smoke point oil when frying. I could have used canola or soy oil, but while it is the most expensive oil to use, peanut oil imparts a better flavor. I found it at our local Costco 4 gallons for the same price as 3 gallons were at some of the chain store around. After checking the oil level needed, I prepared a salt and herb brine to set it in and discovered that the turkey was not fully thawed….after 3 days. I kept it in brine for 24+ hours so it finished thawing in the brine. After that I placed it on the vertical turkey roster in the refrigerator, over night, so it would dry out. The reason you want it to dry out is the old saying “oil and water do not mix”. 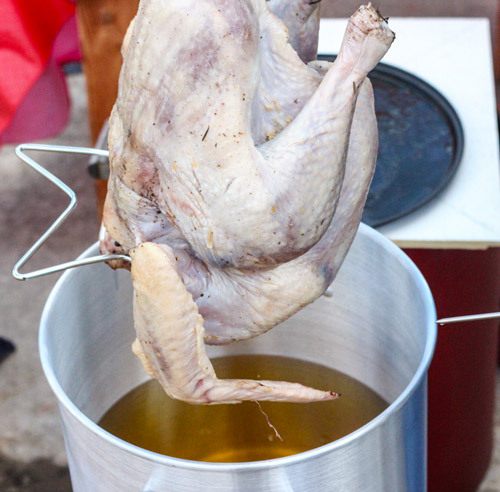 Placing a not fully thawed or wet turkey in HOT oil can be the single most dangerous thing you can do when frying a turkey. On Tuesday evening I injected it with the in and let it sit overnight so that the herb mix had time to permeate the meat. I removed it to the counter on Thursday about 3 hours before I planned to cook it so it would get closer to room temperature. I setup the fryer on a level spot on my front driveway about 15 feet away from the house and moved all the Autos away to a safe distance (I know over cautious, but what the heck better safe than sorry). As part of the setup, I built a wind barrier because it turned pretty windy that day and was messing with the flame under the pot, I also made sure I had a fire extinguisher that was oil fire rated close by. 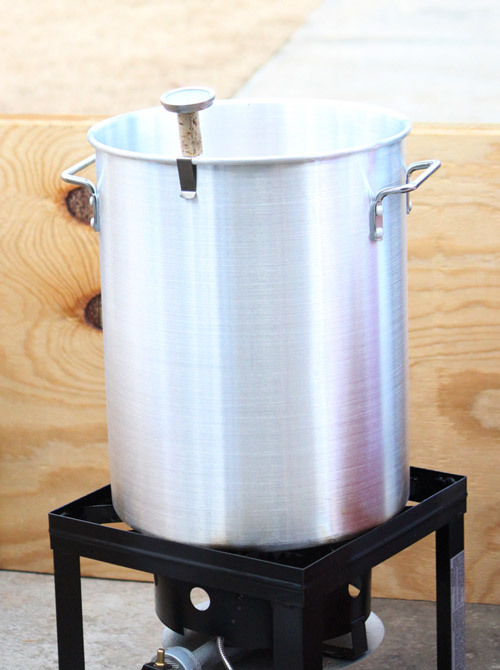 You place the cook pot on the burner stand and fill it with the peanut oil while the burner is not lit. Once the propane burner under the oil is fired up DON’T walk away. It needs to be watched for the entire time the burner is lit for safety’s sake. Once it gets to the correct temperature to start the cook TURN OFF the propane while you SLOWLY lower the turkey into it. Once you have the turkey in the oil re light the burner and maintain the proper temp till it’s done. When the turkey is done turn the burner off before you pull the turkey up an out of the oil. 1/2 cup Mirassou Cabernet sauvignon. After the turkey has been thawed in the refrigerator prepare the brine. Dissolve salt in 4 cups boiling water. Peel the rinds off the oranges and add the rinds to the salt water. Eat the oranges :). Add honey and remaining ingredients. Add salt water to 1 1/2 gal of COLD water. Once the brine is cool, add the turkey. Brine 24 hours or over night. After 24 hours remove the turkey from the brine and pat dry inside and out. Place so that it can drain any trapped fluids and return to the refrigerator. While the turkey is draining and drying, put together the injection. Add the wine and the oil in a small sauce pan and over low heat add the dry ingredients so that they my infuse the oil with flavor. Remove from the stove and set aside to cool. Once cooled strain the solids out and using a needle injector to inject it into the turkey breast thighs and legs. Put as many as you can into the turkey the more evenly they are placed over the entire turkey the more uniform the flavor will be. Chop the whole sage and celery leaves into medium to small pieces and place under the skin, use as much as you see fit. Then return the turkey to the refrigerator and hold there for 12 hours or over night. Remove the turkey from the refrigerator and allow to reach close to room temperature. Setup the deep fryer and bring the oil up to 350° about 20 minutes. Turn off the burner and slowly lower the turkey into the oil giving the oil time to cover the turkey gradually until it is fully in the pot. 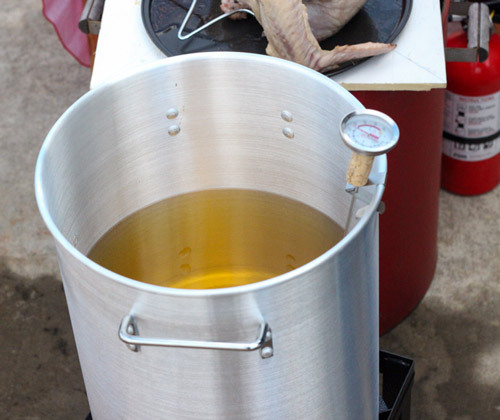 Relight the burner and bring the oil temp back up to around 325° and cook for 3 minutes per pound of turkey. 14 lbs is 42 minutes. I suggest that at the 25 minute mark you shut the burner down and raise the turkey to check the temperature at the thigh. We are shooting for 155° at the thigh. Return to the oil and re-light the burner, if it is not at that temp check again at 35 minutes. Once the turkey has reached the desired temp shut the burner off and take the turkey out of the oil, allowing it to drain the excess oil from the cavity before placing on a platter. Wrap the turkey in aluminum foil. It will continue to cook for about 30 minutes more and reach the internal temp of around 170° measured at the thigh. You may carve it after the rest and have moist delicious turkey for dinner! This was a great cooking experience, and I will do this again soon. Be mindful of your cook times. It only takes a couple of minutes to overcook the turkey this way. I almost did it myself! I used a instant read thermometer I bought off amazon the weekend before because my Maverick ET732 is not rated for submersion in oil. I really think I am going to like using this unit on future cooks. After everything was done and the family was heading home, I cleaned up the cooking oil by straining it with a filter system I bought from Academy Sports. It made cleanup quick and easy. The peanut oil should keep for about 6 months if I store it in a cool dark place. I figure I can use it again a couple of more times before I have to get rid of it for good. So, this was our Thanksgiving turkey cook. I hope you give it a try soon and let us know how it goes. Until next time, be safe and take care!